Webee allows you to create unlimited pages. you can organize the menu toÂ 10 multi level submenu.Â The control panel is divided in three parts: on the leftÂ you see the menu,Â on the rightÂ the box to create a new menu. If you create a page, you find it at the end of menu. You canÂ drag & dropÂ it and choose the position with mouse, even as submenu of a page. Click on page title you want to administer the contents, in the example below is theÂ "new page". If you click on page title it will appear the control page panel. 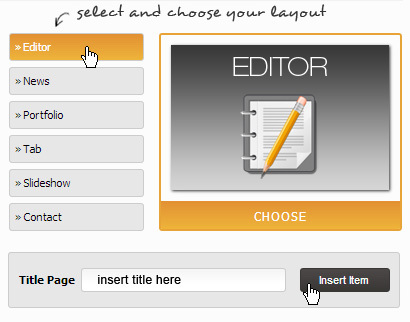 With the mouse click on setting icon (the wheel) to mdify the options(in the example below is "new page". Click onÂ SAVEÂ button to confirm the changes. Click on DELETE button to cancelÂ the page. Click on setting icon (the wheel). In the example below we supposing to cancel theÂ "new page"
ââAt bottom there a DELETE button. It is useful to cancel definitelyÂ the page. Webee allows you to block a page with a password reserving the access to users who have already the password.Â The options can be useful to photographers who decide to reserve the phographer services to same customers. Attention: even after blocking the page if you are "logged" you can see the preserved page content. After blocking the page you have to exit from administration. IfÂ you want to see how the 'no authorized user'Â display the page you need to logout. To create a password for a pageÂ click on "The wheel icon on the right. In the example below we suppose to put a password toÂ "new page"
The field with options will appear on the left. ENTER theÂ passwordÂ in the appropriate box (8 alphanumeric characters). Attention: after blocking the page with the password, if you are "logged" you continue seeing the content page. When you leave the administration, logging out, you will see the locked page, with the graphic above. 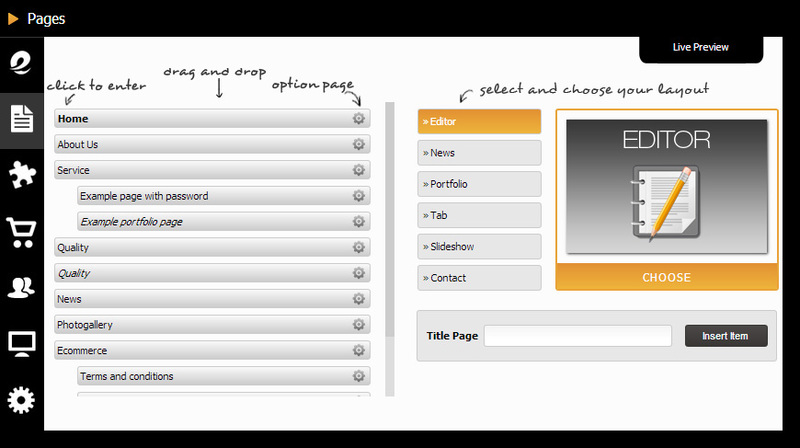 Â The sequenceÂ drag & drop allows to move the menu position, the submenu ect. (As the image shows we move theÂ "about us" menu with its submenu). It is a sequence that thisÂ CMS provides. You can add news, matching an image to each news, insert the author. Deciding between online or offline state. You can also send newsletter to registred member. 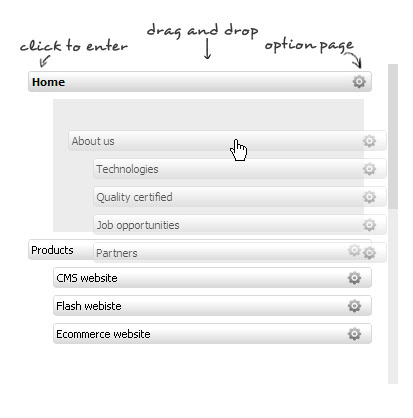 This option allows you to create a horizontal menu. It is useful for showing products, technical data sheet, etc.